This application is currently in evaluation by the Brain-Center-Berlin. The application allows to detect and quantify transitions of the cortical organization in style, frequency and spatiotemporal distribution as the expression of the neurophysiological regulation dynamic. The transition parameters amplitude changes, frequency alterations, topographic changes within the chronological sequence are measured with a resolution of 0.1sec! 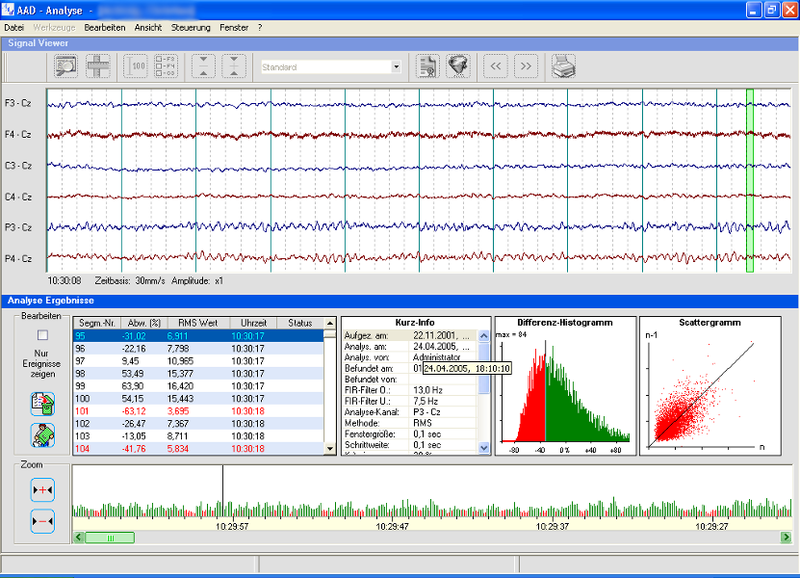 This fine resolution only allows to detect the dynamic EEG pattern which are of interrest when looking into the process of regulation dynamic. The target of the above explained analytical method is to allow a quantitative confirmed regulation dynamic typification based on neurophysiological level and to oppose this to a grouping based on psycho-pathological level. The results of visually analysed EEGs from many Patients suffering from ADHS seem to indicate that such a relationship between the regulation dynamic at neurophysiological level and the regulation dynamic at psycho-pathological level exists. Single investigations let expect that also a different reaction dynamic to bodily centered, psycho-therapeutical and medicamentous treatment can exist in different constitutional types.